Oh, a swimming musical. Why have I not been watching these? The Higgins family is a family of swimmers. Every single morning Pa, Ma, Junior, Katie (Esther Williams), and Suzie jump up seemingly at the crack of dawn to do some laps in the local swimming hole. And, it being a musical, they sing a wonderfully cheery song as they get ready to swim. When Katie is spotted by a somewhat lecherous salesman one morning, the family ends up with the chance to swim in a race across the English Channel in order to promote his product. Although the rest of the Higgins family deems the English Channel too cold, Katie continues to train. 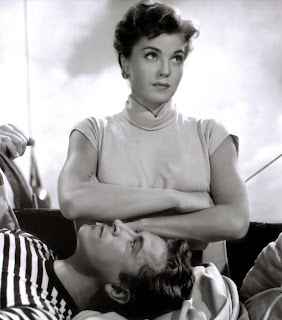 One day, during a foggy training session she loses sight of her salesman coach in his rowboat and is pulled aboard the sailboat of the charming and dashing Andre (Fernando Lamas - who became Esther Williams's husband). There are passionate looks, vows to stay away for the sake of the race, and several minor scandals. On their first date Andre gives Katie a bikini as a gift! Andre invites Katie over to his house to meet his mother, and his mother isn't there! And she stays anyways! And they go swimming together! 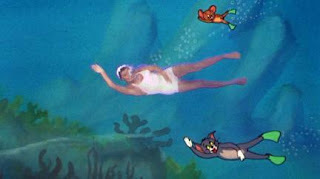 The movie even contains a dream sequence in which Katie swims with Tom and Jerry. I searched and searched for a photo of the great goggles worn in the movie... no photo to be found. Just picture the most wonderful gigantic swim goggles imaginable... and then double their size. Oh how I want those goggles. And then of course there is Katie's heroic swim. Three stars. I would love to see this again. 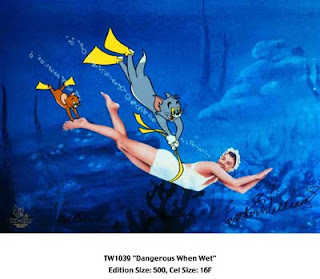 And bring on the Esther Williams movies. Are they all so wonderfully silly? I love that scene with Tom and Jerry. Have you seen Gene Kelly dance with Jerry in Anchors Aweigh? He was a busy mouse.